This handy pocket-sized guidebook does what it claims, giving you the inside information on the multi-facetted region of Berchtesgaden. 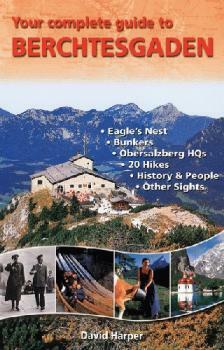 Highlights include an in-depth look at 3rd-Reich-related sights (history and self-guided tours of the Eagle’s Nest and Obersalzberg, as well as the underground bunker system) plus 20 beautiful hikes and the main sightseeing attractions. This book by David Harper costs EUR 15 plus EUR 4 shipping and handling within Europe or EUR 5 shipping and handling to North America and the rest of the world. To order the book we require a Visa or MasterCard with expiration date as well as your mailing address.